be quiet! 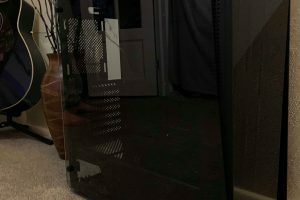 is a company that has been a round for several years making CPU coolers, silent fans, quality PSUs and also epic computer cases. 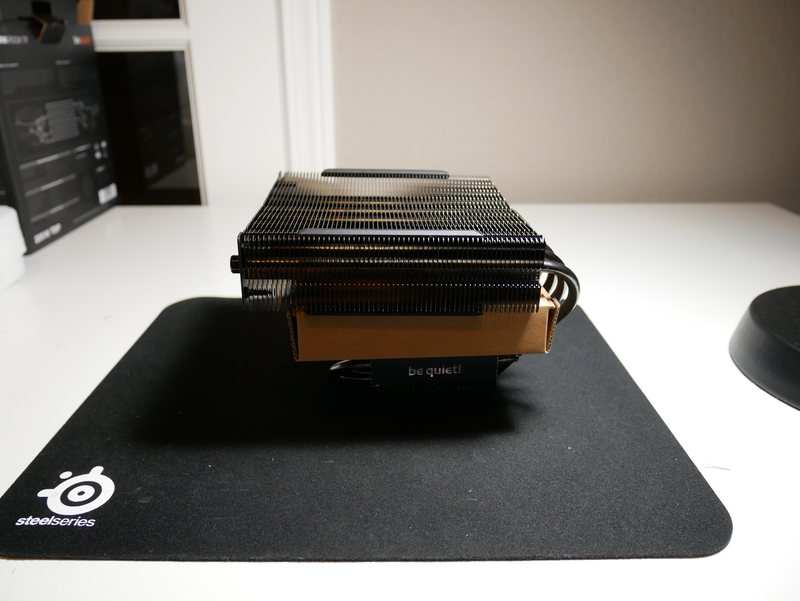 They have been known to compete with the big dogs for CPU cooling, such as Corsair, Cooler Master and Noctua. Their silent fans are known to be some of the quietest in the business. 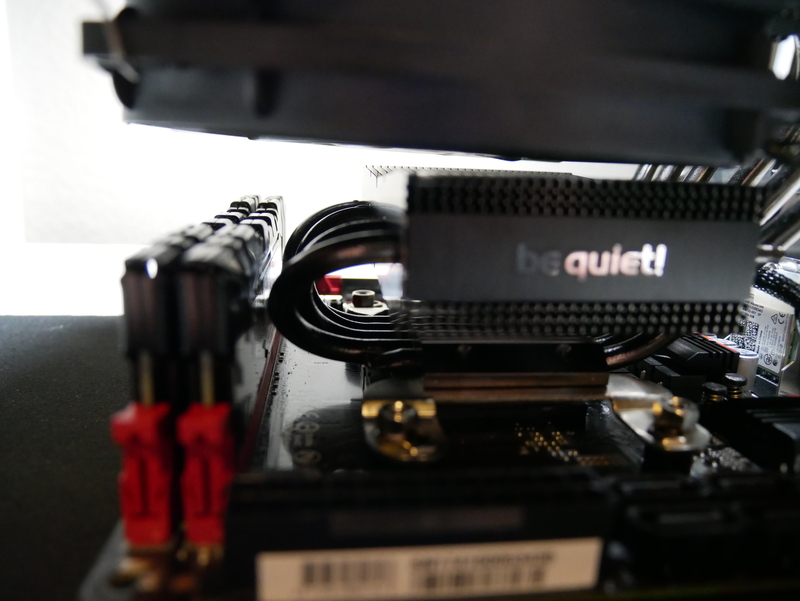 Today we will take a closer look at a cooler from their well-known Dark Rock lineup, the be quiet! Dark Rock Pro TF ($85 MSRP). 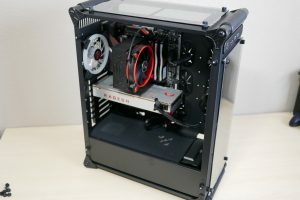 Extreme Cooling Performance – Double-tower for double power: Thanks to its double-tower layout this cooler is a true cooling marvel with 220W TDP – just perfect for the extreme conditions found in the overclocked CPUs of compact gaming PCs. Ingenious Construction for Maximum Effect – Powerful cooling for your components: Dark Rock TF contains two nickel-plated aluminum heat sinks. 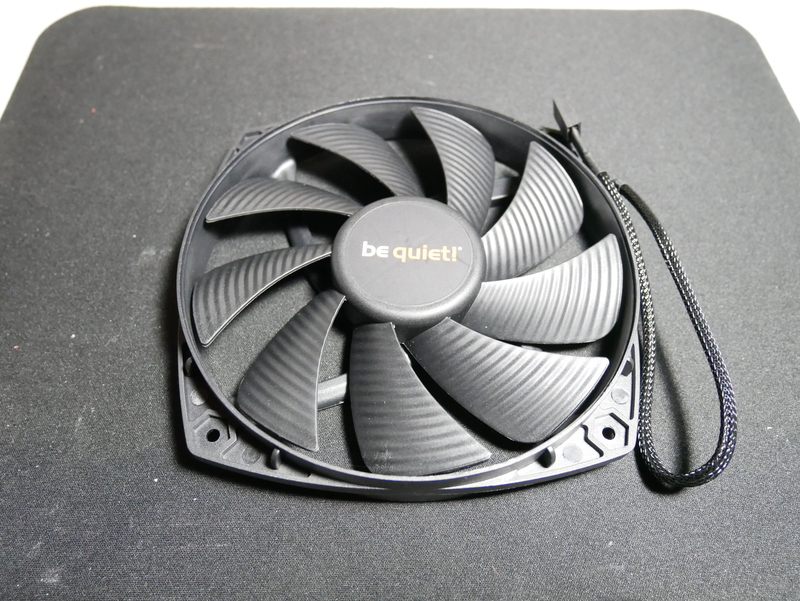 Two fans are pre-installed, but a single fan assembly is also possible, offering further space savings and even quieter operation. 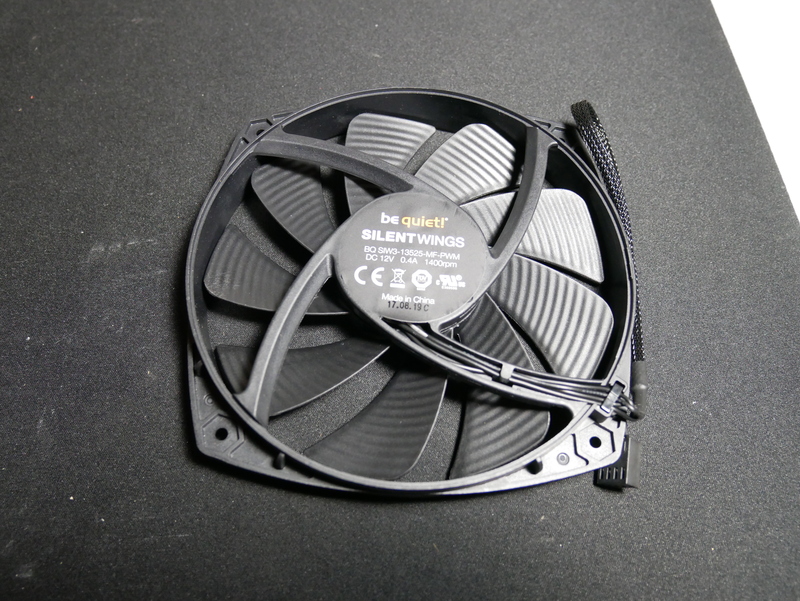 Virtually Inaudible Operation – Cooled by SilentWings® technology: The cooler is equipped with two SilentWings® 135mm PWM fans. They feature advanced fluid-dynamic bearings, smooth six-pole motors and nine airflow-optimized fan blades. The noise is a meager 26.7 dB(A) even with 100% PWM fan speed. 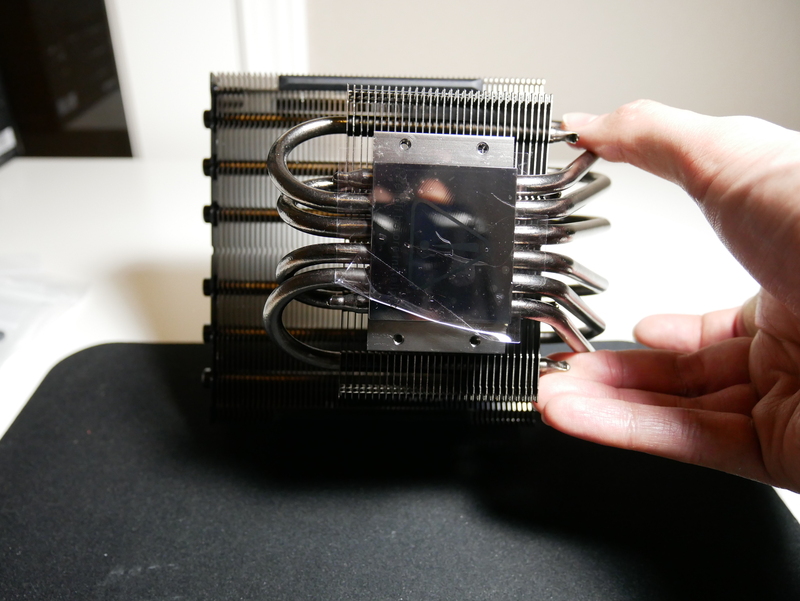 High-Performance Heatpipes – The centerpiece of ever CPU Cooler: Dark Rock TF has six high-performance 6mm heat pipes with aluminum caps. They carry heat to the optimum location on the cooling fins. 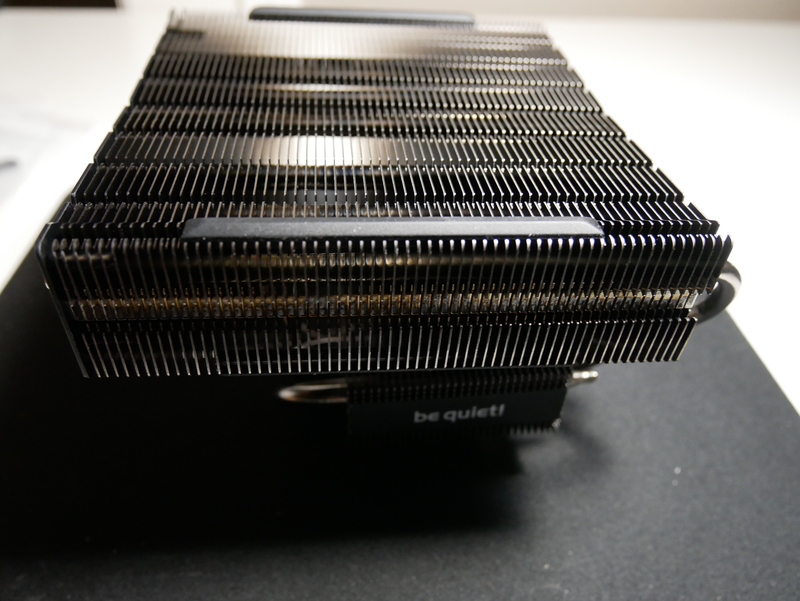 Anti-vibration rubber inserts on the cooling fins of the heat sink further dampen noise. Space-Saving Design with Great Effect – Highly functional cooling concept: The space-saving topflow design provides ideal cooling, not only for the CPU, but also for surrounding components. 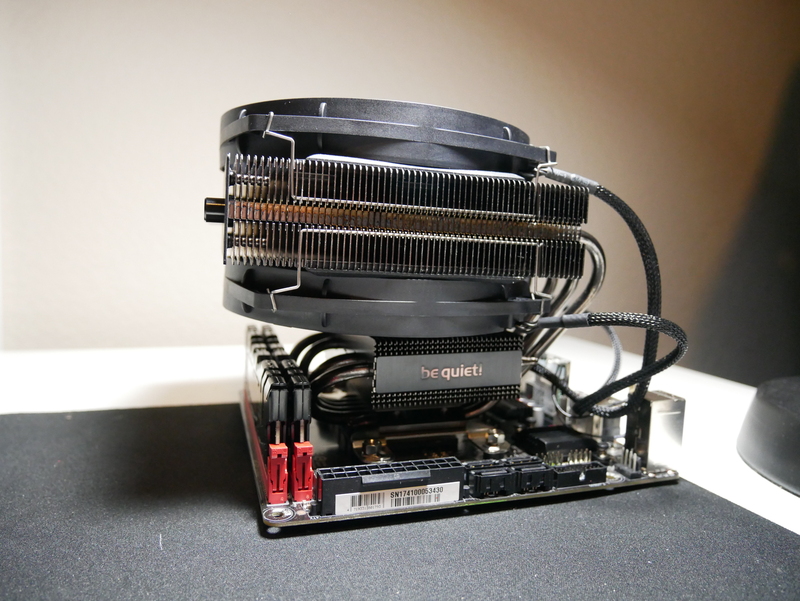 It can quietly cool a high-performance, overclocked CPU in a confined space. 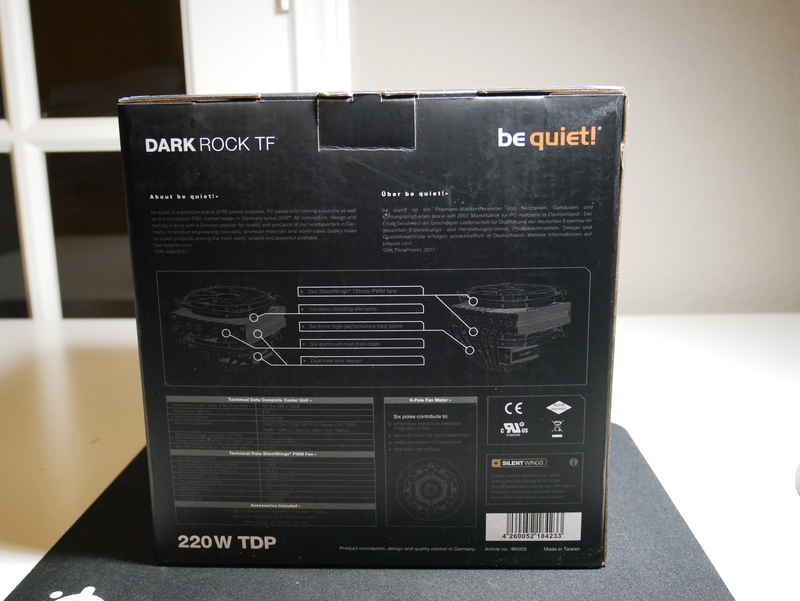 Starting out with the outside of the box, in the front you have a nice picture of the Dark Rock TF and that it has a 220W TDP. The back of the box has a break down of the cooler and also the details specifications found above. 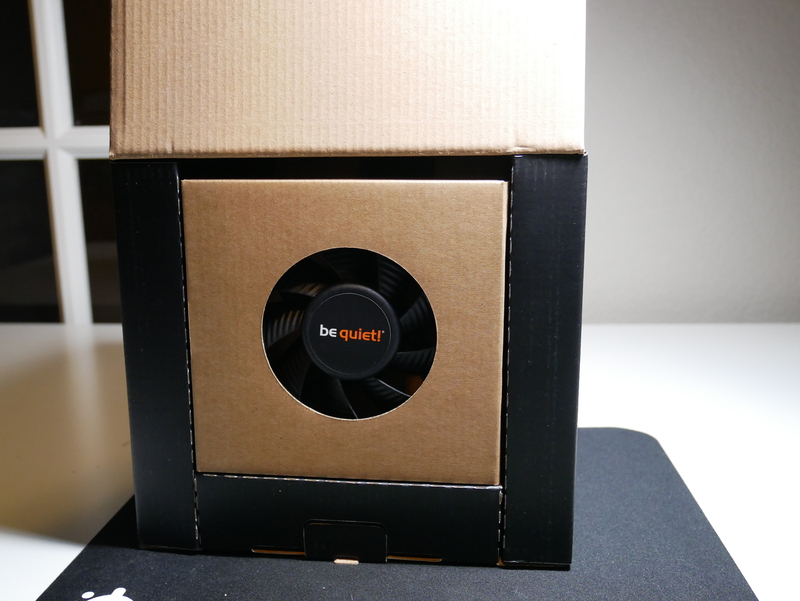 Opening the box, you are greeted with the sight of one of the 140mm be quiet! SilentWings fans. Here is a closer look at the SilentWings box. Next is the instructions manual found in many languages. 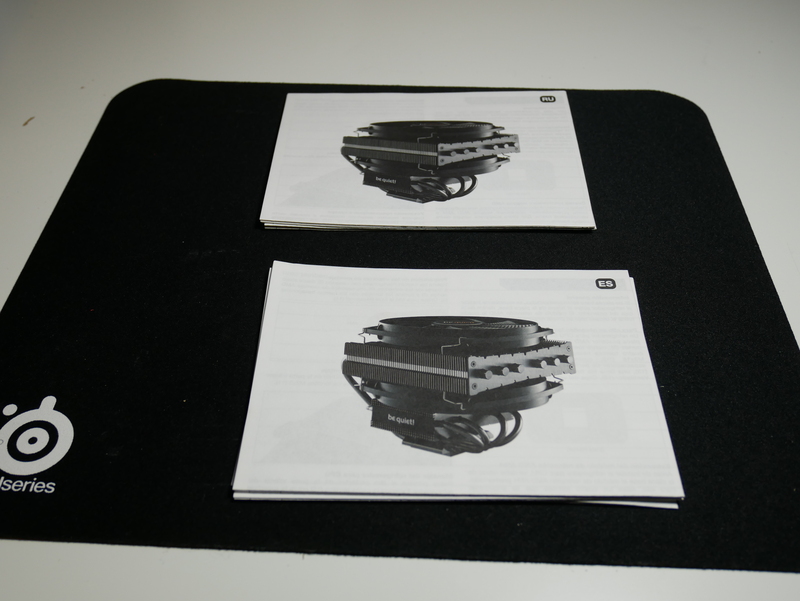 The instructions are very clear with not only words, but also detailed pictures to show exactly what you need to do to mount the cooler. Next you notice the cooler is encased in two giant pieces of soft cell foam. 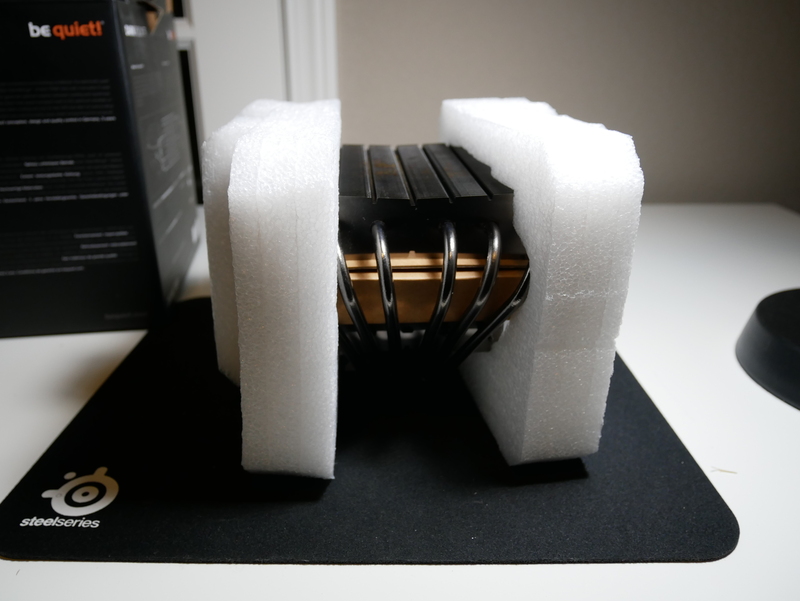 The mounting hardware box is found wedged in between the fin stacks. 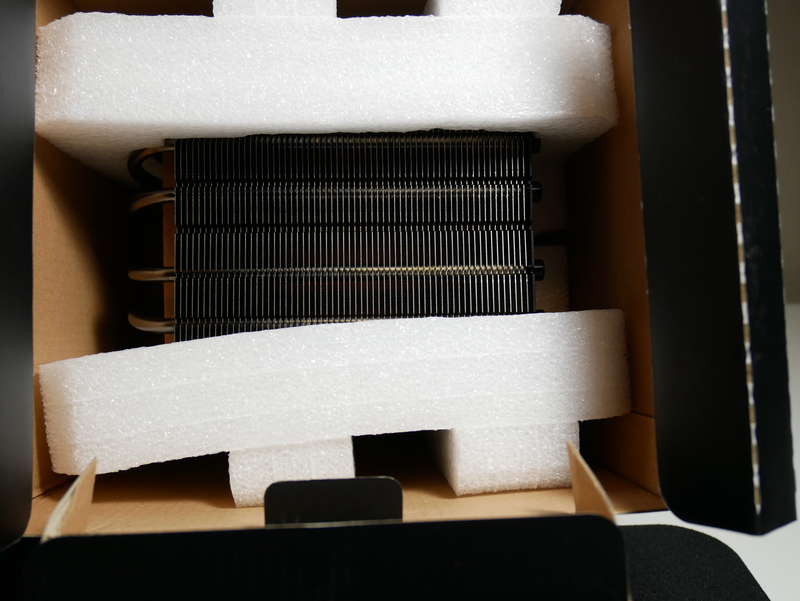 Taking a closer look at the cooler, you notice the large fin stack and also a smaller fin stack above the CPU cold plate. 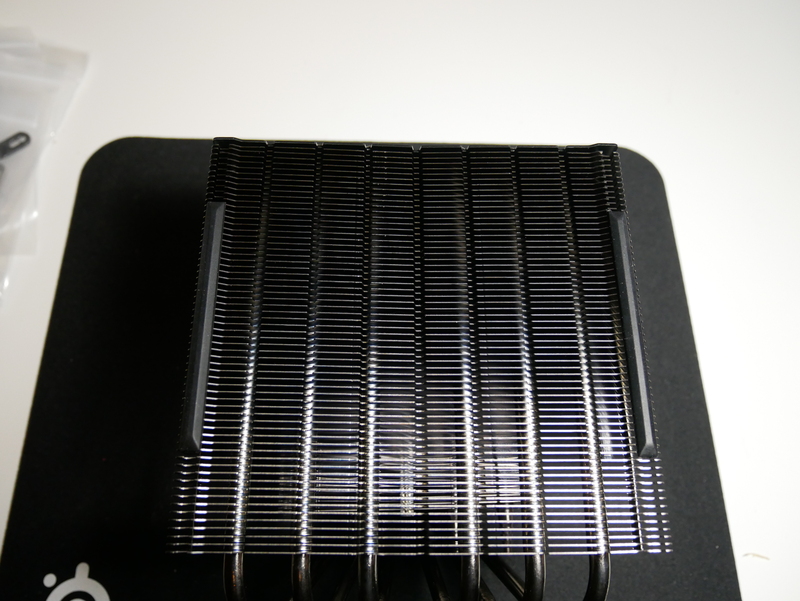 The color theme of the CPU cooler is that the fins heatsink fins are black and the heat-pipes and cold plate are nickel plated. The large fin stack is large enough to be covered by the two 140mm SilentWings fans. They are attached to the CPU cooler by your traditional fan clips. On both the top and bottom of the top fin stack are rubber isolation vibration strips that help minimize the fan vibrations. You can notice the heat-pipes travel from the upper fin stack, down to the cold plate and then back up to the lower fin stack. 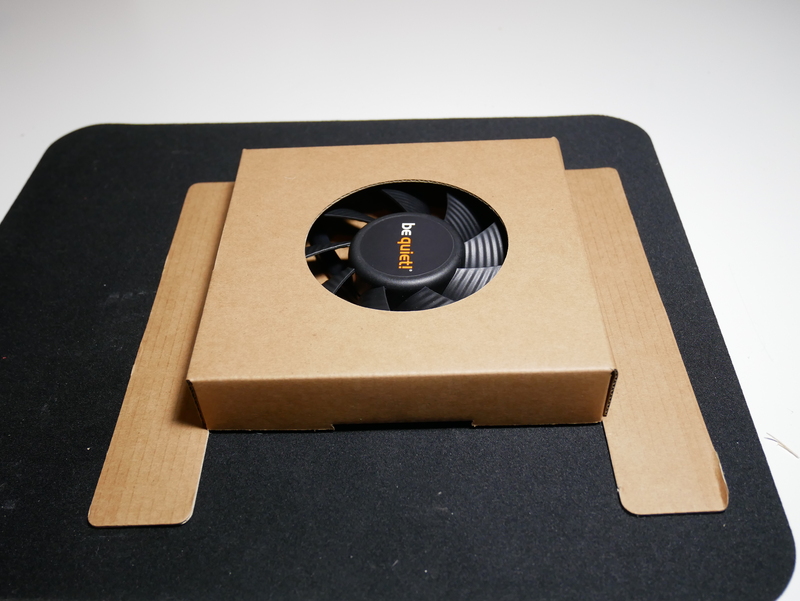 This allows the heat to be dissipated by the down firing 140mm fans. 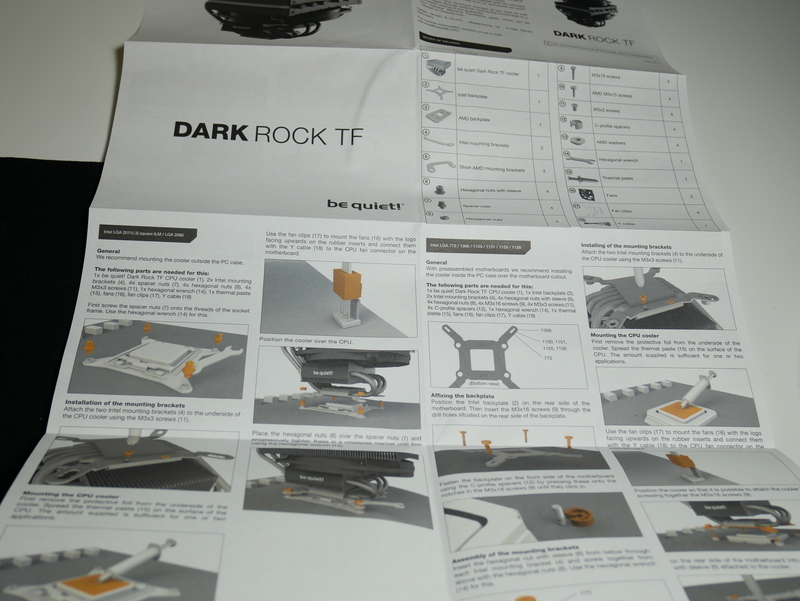 The advantage of a down firing CPU cooler like the Dark Rock TF is that it will also cool your VRM cooling components around the CPU socket. 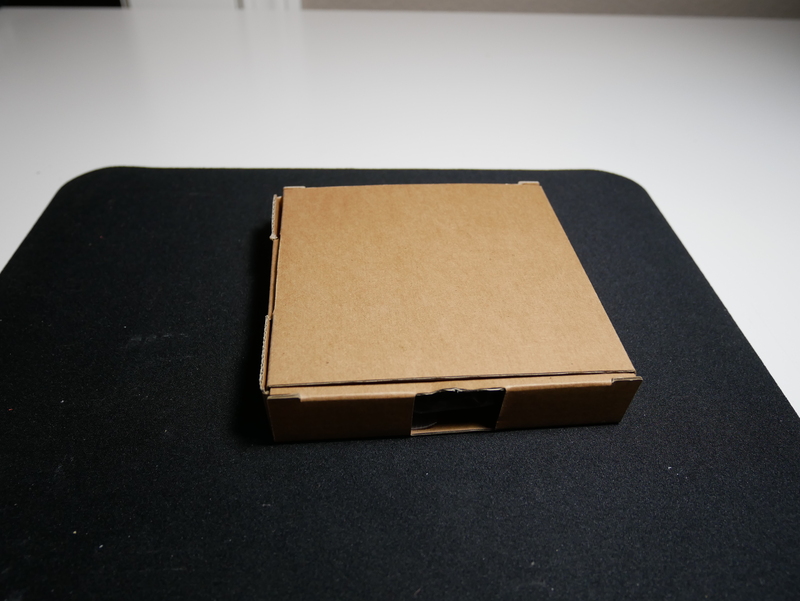 The accessories box is fairly small with how much mounting hardware is inside. 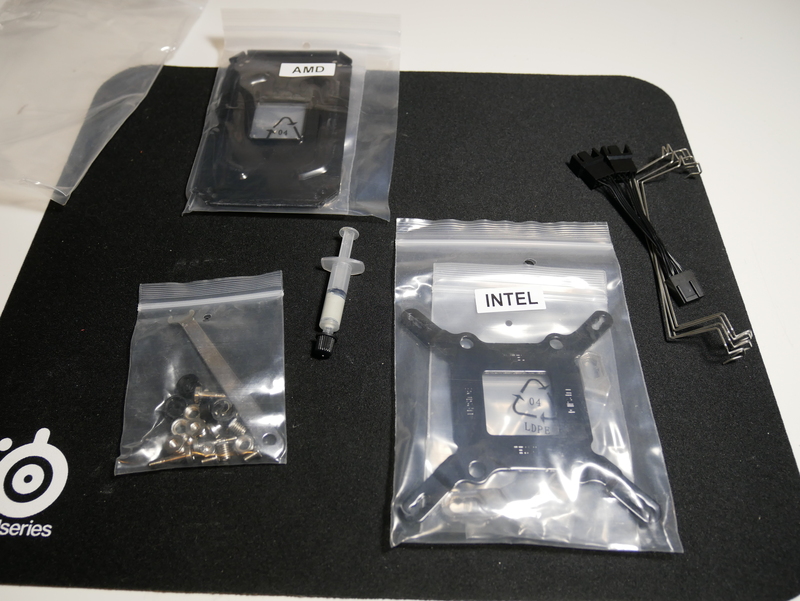 You have two packs with the backplates for both AMD and Intel sockets, along with the different lengths screws needed for each socket. You get a nice tube of thermal paste, so glad its not a packet. 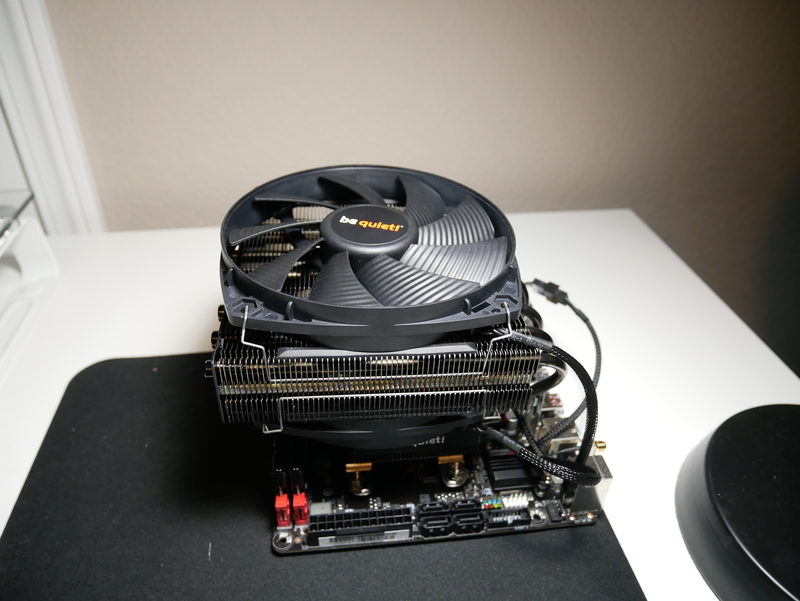 A fan splitter to be able to connect both of the 140mm fans to the single CPU 4-pin on your motherboard. Lastly, there is the bag of mounting nuts, retention nuts and a wrench. Installation was pretty straight forward following the directions. The first thing to do was to attach the backplate for your socket type, threading four screws through the backplate and then installing the retaining plastic clips to hold the backplate on. 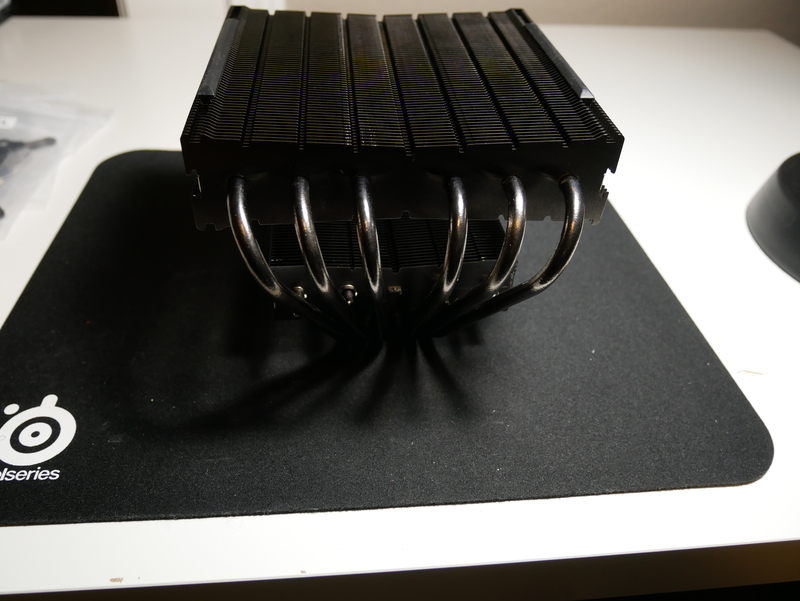 The next step was mounting legs to the cold plate with four screws. This was followed by installing nuts on the mounting legs. After applying some thermal paste to the CPU, you sent the Cooler down and tighten the screws from the back of the motherboard. 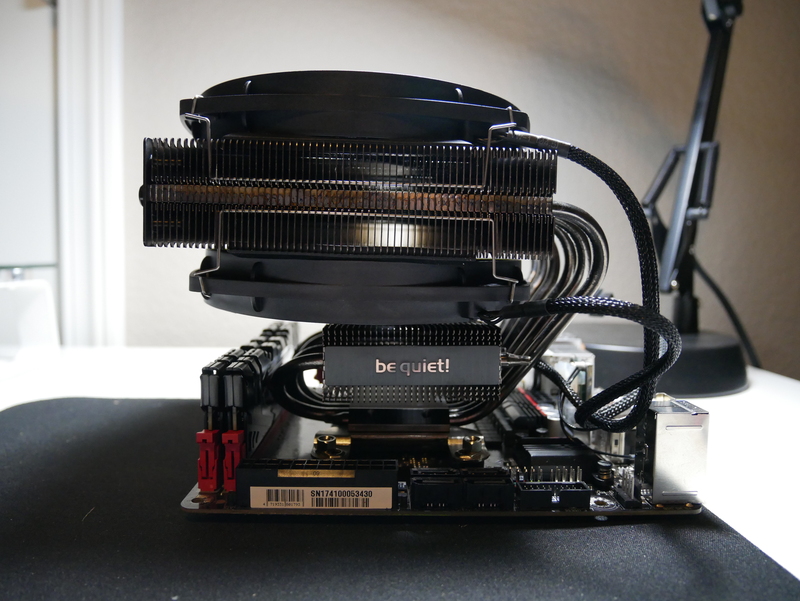 The following are what I believe to be a great group of real world representative tests to be able to stress the CPU and integrated Vega GPU and lastly the CPU cooler that is attached. 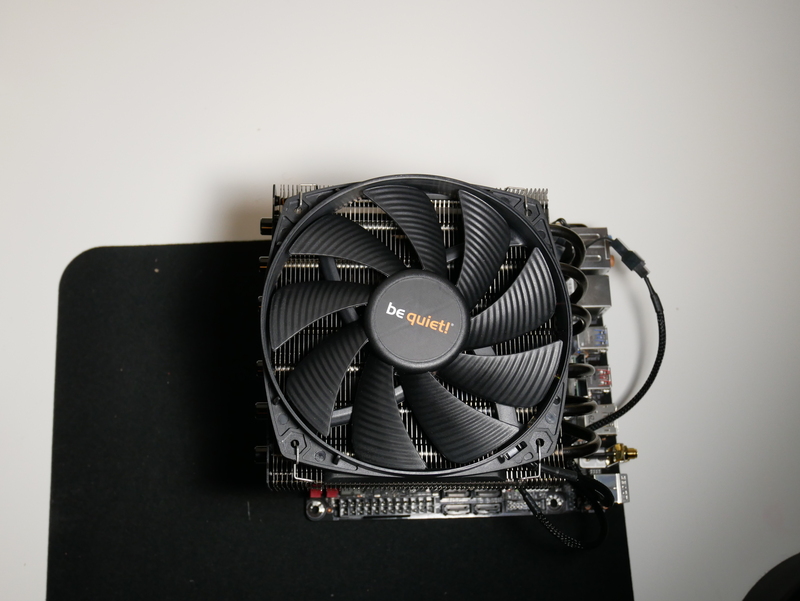 The ambient temperature of the room during testing is 20 C. The testing was conducted with the 2400g stock settings, an Overclock of 3.9 Ghz on the CPU, an Overclock of 1500 Mhz on the GPU and lastly both the CPU and GPU Overclocked. During testing the hottest package temperature is recorded. The Dark Rock TF was able to keep system idle temps below 24.5 C in all variations. When testing Metro Last Light you can see the strength of the Dark Rock TF with a Max temp of only 58 C. That temperature occurs when the internal Vega GPU is overclocked to 1500 Mhz, which does tend to produce some great heat. In probably my most stress full temperature test, the Dark Rock TF was able to keep the temps in control with a MAX temp of 70.6. For a game that is primarily used as a benchmark, the Dark Rock TF was able to keep the 2400g (1500 mhz on the GPU) at a chilly 62.5 C, compared to the toasty 98 C with the Wraith Stealth. With all of the actions on the screen at the same time, the CPU is really stressed and the Dark Rock TF had not issues cooling the 4-core, 8-threaded 2400g. Rise of the Tomb Raider tends to stress the GPU more than the CPU, but even when the internal Vega GPU was being stressed, the Dark Rock TF was able to keep the 2400g no higher than 54 C.
During testing of Cinebench R15, the Wraith Stealth allowed the 2400g (GPU 1500 mhz overclock) to climb to a toasty 93 C after one run. 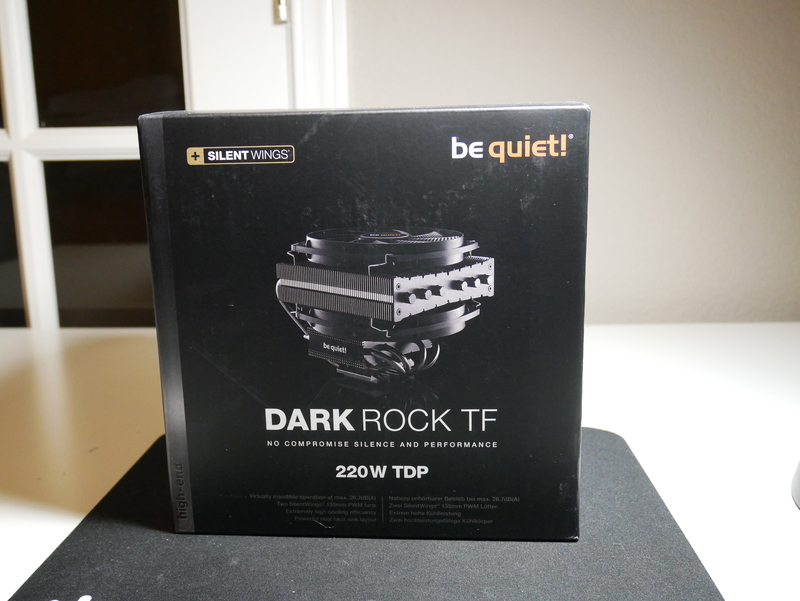 The Dark Rock TF was able to keep the temperatures in check of this short but demanding load and only had a Max temperature of 67.3 C.
The Bottom Line If you are in the market for premium down draft CPU air cooler, look no further than the be quiet! Dark Rock TF.